Throughout my life the music of Claudio Monteverdi (1567-1643) has become increasingly central to me. Of course he was one of the beacons of early music. Although his music reflects his times there has become a point to me where his music stands alone, apart from the era, like Bach for a later period. Feeling like I do I welcomed the chance to review a new version of Madrigals Book 8 "Madrigali guerrieri et amorosi" (Naxos 8.573755-58) by Delitiae Musicae under the direction of Marco Longhini. The four-CD set manages to luxuriously include all the madrigals plus the lengthy 48 minute "Ballo delle ingrate." Delitiae Musicae approaches the music with loving care and period rigor. The Ensemble vocale features nine singers used in varying combinations. Included are two countertenors and a boy soprano in keeping with performance practices. The Basso continuo comprises some nine players, including baroque harp, two theorbo and so on. Then as called for there is the Ensemble di viole da gamba (with soprano, contralto, tenor, and bass instruments). Finally there is the string section per se, the Ensemble di archi barocchi, with eight instrumentalists. Throughout the course of the program, the continuo is a constant, the singers are assigned solo, duo, and other small configurations in contrast with the tutti passages. Similarly the ensemble instrumental groups appear variably according to the demands of the score. The sensitive timbral period dimensions of the music bring to us an authentic and beautiful sound. All come together in varying combinations for a sterling performance in all its facets. This is later Monteverdi in full flower, with contrapuntal imitation contrasting with homophony in various Montervedian ways. As the composer states in his introduction to Book 8, the music addresses the "agitated," the "soft" and the "moderate" in ever varying sequences. Contrasts too are ever present between the "theatrical" and those numbers that are more purely musical, that are to be "sung" more than enacted. The resultant whole that is the sequence of Book 8 has a richness and inventiveness brought out wonderfully well by Delitiae Musicae. The full effect of the totality is cumulative. 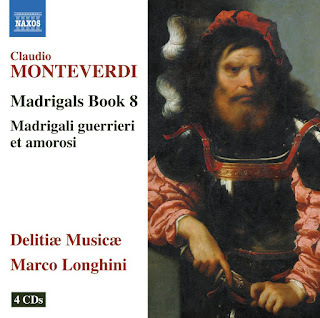 By the time you come to the end, you feel you have grasped the extraordinary beauty and character of later Monteverdi with a period faithfulness that brings out the wealth of expression that marks out Book 8 as exceptional in itself. The Naxos price just adds to the desirability and attractiveness of the set. It is a near ideal performance of music one must dwell within for a time to make it live for you. Once you do that, you are transported! Howard Hersh is a composer with lots of ideas, inventiveness, and an open stance as to how to position stylistically. I reviewed and loved his album of keyboard music, Angels and Watermarks (see post of March 27, 2015). The Piano Concerto showed him to be very adept and original in his "post" approach to long form, and the solo harpsichord works gave us a more intimate view. Now we get a lot more music on the strictly chamber side of the coin, Dancing at the Pink House (Snow Leopard Music 201). The five compositions all show Hersh off as a musical poet not satisfied to remain in place, but ever to move forward. "Madame's Tavern" (2014) opens the program with Mary Rowell on violin playing against a "phantom choir" of 15 pre-recorded violins. It is a sort of mini-concerto with a wealth of inventive signposts in a continually moving matrix both expressive and beautiful in a sometimes relatively hard-edged yet evocative manner. It leaves an impression of a lively musical mind, restless but elated. "Loop" (2006) pits cello, piano and vibraphone in a mysterious, ostinato based blend that opens up another vista and breaks through to it with a forceful, then gentle plein air traversal. It is a landscape we simultaneously sense an uncanny deja vu with but then find much that rejuvenates our living within it. A ravishing work. "I Love You, Billy Danger" (2012) gives us 12 minutes of solo piano music. It is a sort of aural tongue-twister with a dashingly bold modernistic flourish to it. This is quite involved and difficult to play pianism which Brenda Tom tackles heroically and effectively (as she so capably and brilliantly did on Howard's last album). It rolls forward inexorably and memorably, then abruptly hushes, only to pose a series of quiet questions, all of which have emphatic answers. Then gradually the question itself becomes the answer as it morphs into full thematic flower and onwards from there. "Night" (2013) takes us into trio territory again, this time with clarinet, marimba and percussion. The clarinet part projects outward in a sort of post-Gershwin jazzy way. The marimba puts down a mobile wooden flooring of sorts that enables the clarinet to bound forward. The percussion subtly punctuates and colors. Momentum takes a hold with a more rhythmically vibrant marimba part that then opens up to quieter realms again. "Dancing at the Pink House" (2006) deserves its title status with clarinet-piano folk-modern-vernacular expressions with a quietly driving motility of a dance-like sort. Ultimately the dance calms and opens up to a more lyrical introspection, ultimately to return to the motion of body-in-movement, and in the end to take on a quotation from "America the Beautiful." Unforgettable, this is. And that is the whole of it, or as much as I can touch upon in this framework. It is music that holds a place in your musical memory as something with a very personal, original fingerprint. It is music that continually underscores its presence in the contemporary United States, yet transcends that rootedness too with a music anyone can appreciate who has the ear to do so. Very worthwhile! Hersh is a voice. Toshio Hosokawa is one of the premiere living Japanese composers. I have covered his music before (see the September 23, 2014 post and also that from November 3, 2011). 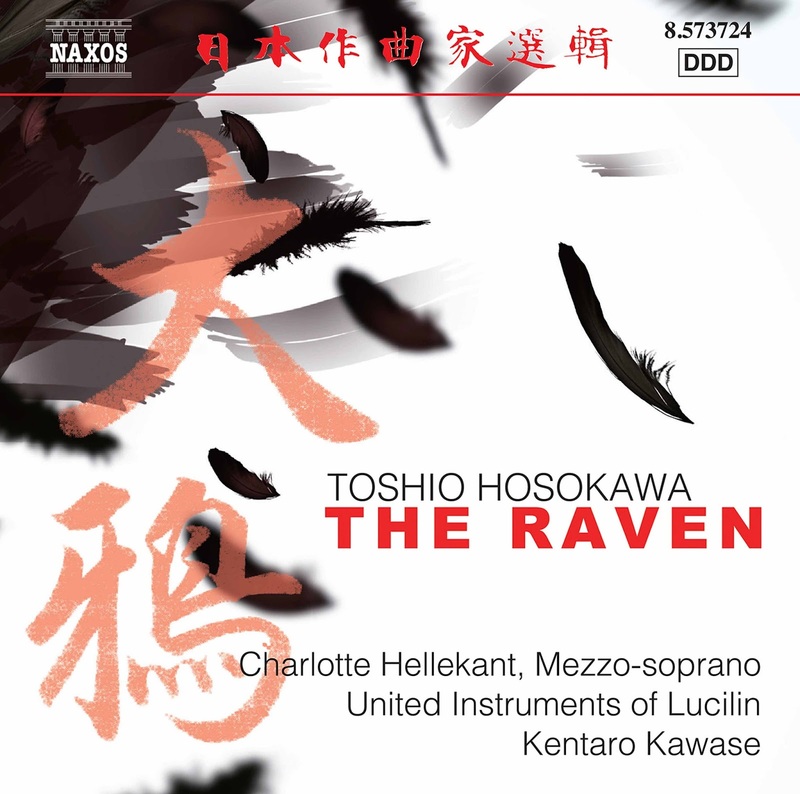 Today we have The Raven (Naxos 8.573724), a modern-oriented work for mezzo-soprano (Charlotte Hellekant) and chamber orchestra (United Instrumentation of Lucilin under Kentaro Kawase). It is based on Edgar Allen Poe's iconic poem. A full recitation of that is followed by Hosokawa's work, which in turned is presented in the form of a traditional Noh drama. The music is spacious, sombre, mysterious and more or less high modernist in its sprawling expanded tonal rigor. The dark mood has a musical analogy, which is sure-footed and very atmospheric. Mezzo-Soprano Hellekant and the United Instruments of Lucilin give us a detailed and carefully expressive reading of the work. Poe's poem and its raven-centered theme appealed to Hosokawa for its similarity with Traditional Japanese tales, which often focus on plants and animals in dialog with human subjects. He felt that it readily lent itself to Noh dramatic treatment. For The Raven work Hosokawa transforms the narrative human subject from man to women, which also is consistent with Noh tradition. To the Western listener such elements are not readily apparent so much as there is a cogent use of aural spaciousness that Noh music shares with this work. The composition is dedicated by the composer to Hellekant and United Instrumentation. The close rapport between music and performers is apparent and a large factor in the success of the disk. One at this point could scarce imagine a better reading. It is a rarified music of great dramatic heft. 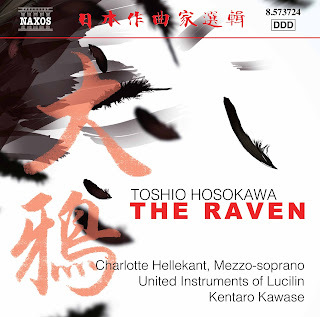 One is given yet another chance to appreciate the breadth and scope of Hosokawa's poignant music vision. All interested in Japanese modernism today should hear this one. It is revelatory and absorbing. It is never out-of-place in my listening habits to be introduced to a very modern and modern tonal pianistic composer as played by a very talented and musical pianist. This makes me a happy camper. That is the case with Pompa-Baldi Plays Roberto Piana (Centaur CRC 3563). Roberto writes for the solo piano like he really loves it and respects too the contemporary proficiency level that is state-of-the-art today. Piana works inventively and imaginatively to create very memorable modern works that have beautiful movement built in, an almost Satie-esque disarming directness, and plenty of modern spice as required though also a sophisticated harmonic-tonal playfulness. 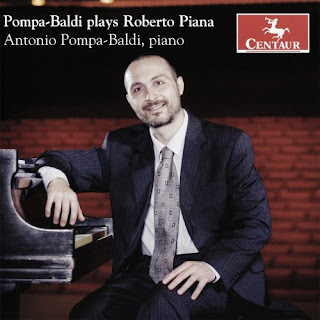 Antonio Pompa-Baldi plays the "25 Preludi Pittorici" and the "Piano Sonata" like he was born to them. All require an integration of very evolve technique into a varied and very communicative sense of form and motival freshness. 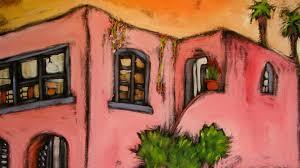 Pompa-Baldi brings out the lyricism with care and great artistry. The quasi-impressionist dazzle and the dynamic motility of these works engage strongly thanks to the near-ideal performances. I cannot imagine that those attending to this music with care will not find much to intrigue and please. It may be one of the sleepers of the year. Gradually you realize you are in the presence of a contemporary greatness. By all means, spend some time with this one and see if it does not grow on you! A most unusual volume today. 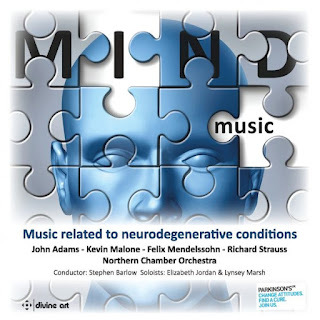 MIND Music: Music Related to Neurodegenerative Conditions (Divine Art 25138) gives us four compositions on two CDs. It was an outgrowth of a concert given by clarinetists Elizabeth Jordan and Lynsey Marsh in honor of their two parents who died in 2014 from complications arising out of Parkinson's Disease. The concert was to raise money for Parkinson's UK. This album was conceived in the same spirit. Its proceeds will go to Parkinson's UK as well. All four works on the program have something to do, as the title suggests, with neurodegenerative afflictions. Felix Mendelssohn died at age 38, probably of a subarachnoid hemorrhage, which is sometimes linked to Parkinson's. His "Concert Piece No. 1 in F Major, Op.113" for clarinet, basset horn and orchestra has nothing directly to do with his ultimate end, nor need it. It apparently came about via Felix's craving for Bavarian dishes, which were unavailable to him while he lived in Berlin. A deal was struck with the father-son clarinet soloists Heinrich and Carl Baermann. They would prepare two of Felix's favorites, steamed dumplings and sweet cheese strudel, and he would at the same time write them a concert piece they could perform on tour. Hearing the work so nicely performed by Jordan, Marsh and the Northern Chamber Orchestra, I would imagine that the clarinet duo were on the winning end of the deal. It is a delight to hear. The work that follows, Richard Strauss's "Sonatina No. 1 in F Major for 16 Wind Instruments 'From an Invalid's Workshop'" was a product of the period following Strauss's completion of the opera "Capriccio" in 1942, after which he vowed to compose no more. He broke that vow regardless with some very beautiful music. The Sonatina was one such work, written while Strauss suffered from a series case of influenza and also was in depression, the latter in part because of the wartime destruction of the Munich Court Theater, which had important associations for him. The music is bracing and in turn regretful. The performance is quite worthwhile to hear. The central work of this program to my mind is John Adams' "'Gnarly Buttons' for Clarinet and Small Orchestra." It has much to do with his clarinet-playing father, who succumbed to Alzheimer's. The music is magical, with ordered variations on cellular motives but also a sort of quasi-naive, folk quality that reflected his father's involvement with marching band music (as well as jazz and classical). His decline is reflected in the music as well. Kevin Malone's "The Last Memory" for Solo Clarinet comes out of his experience with his father and the degeneration from Alzheimer's he endured. His father's struggle to differentiate from current events and the memories of past events has thematic implications in the realization of the work for clarinet and digital delay as a sort of mind as echo chamber, where past memories recur in the mind again and again, creating an internal state as strong or even stronger than external real-time presence. It is a haunting work and well done for all that. In sum this is very worthwhile music. The Adams work alone is worth the price of admission. Yet all of it fascinates and pleases. And you will be helping Parkinson's UK! Without a doubt composer Terry Riley has been one of the most important composers of our time, creating the iconic "In C," arguably the most influential and appreciated composition in the rise of so-called minimalism, and then going on to follow his own muse, ever broadening his outlook in a body of works that retain high interest and embrace innovative approaches to this day. 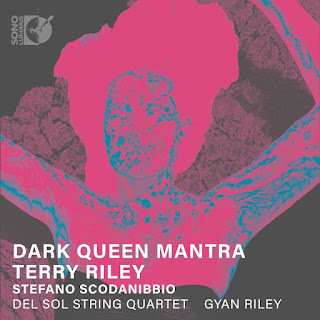 Dark Queen Mantra (Sono Luminus 92215) presents the title work written in 2015 for guitar (Gyan Riley) and String Quartet (Del Sol String Quartet). It is followed by the 1983 quartet work "The Wheel and Mystic Bird Waltz" and Stefan Scodanibbio's "Mas Lugares (su Madrigal di Monteverdi)" (2003). The Scodanibbio "Mas Lugares" combines minimalist motor-propulsive forwardness with starkly effective re-presentations of a Monteverdi Madrigal. It is a deft intermingling of string color and repetition versus through composition. Riley's "The Wheel & Mythic Birds Waltz" stands midway between "In C" and the title work. It is motor-rhythmic and cyclical-repetitive in a much looser way than Riley's earlier work and that of typical proto-minimalism. It is clear hearing the 1983 composition that he had well begun to distance himself away from the trance underpinnings of the initial music yet still remain melodically vibrant in his special way. The "Dark Queen Mantra" of the title further realizes the movement away from the trance-inducing early work that we still hear vestiges of in the "Waltz." "Mantra" turns it further towards a continual development and a horizontal melodic openness. It positions itself mid-point between quasi-Indian modal form and classical-structural considerations. It is fully freed from the trance-over-time change of "In C." It does all of this in brilliant ways very much characteristic of Riley's overall lyric thrust. It is a work of honest yet baroquely complex beauty! When we weigh all three works on this CD program we come away satisfied that some important post-minimalist music has reached our listening selves in enlightening and pleasurable ways. Kudos to all concerned! Apparently there have been shifts in the outlook of Romanian composer Horatiu Radulescu (1942-2008): his Romanian period, the "plasmic music" of his post-Romanian days (during the first part of his residency in Western Europe), and the final phase, which worked at times within more traditional forms, albeit in very personal, idiosyncratic ways. The latter is represented in the first volume of Piano Sonatas and String Quartets I (Mode 290). The JACK Quartet and pianist Stephen Clarke nicely do the honors for the program. For this initial installment we hear the "String Quartet No. 5, Op. 89 'before the universe was born'" (1990-95) in first recording. Its sprawling sonic panorama of harmonics is hardly traditional except as accommodated to string quartet instrumentation. The piano works heard here on the other hand at first have a more straightforward simplicity about them. 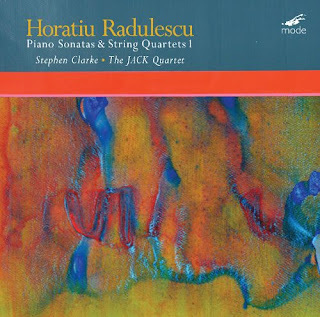 The Romanian folk-like diatonicism-plus disarms on the "Piano Sonata No. 5, op. 106 'settle your dust, this is the primal identity'" (2003). Yet it is something more than a primality. The "Piano Sonata No. 2, op. 82 'being and non-being create each other'" (1991) is more overtly modernistic though at times folk-like as well. There is a post-Messiaenesque deliberateness that nevertheless has Radulescu's personal stamp on it, as it were. The first movement has widely spaced, powerful sonarities. Movement two uses mixed modalities and a held right pedal to represent "Byzantine bells." The third movement has an ostinato in 15 with fragments of earlier works quoted in the right hand. All-in-all this is a most promising start to the series. All the works have a special idiomatic quality to them, an around-and-back melding of modernism and a whispy suggestion of archaic antiquity as filtered through Radelescu's musical vision. I recommend this one warmly to you. Komitas (aka Komitas Vardapet) (1869-1935) was Armenia's principal composer of the modern period. Khatchaturian may be better known, but then he was as much Russian as Armenian in style. Komitas thrives on a recent release of his Piano and Chamber Music (Grand Piano 720). The music has a strong traditional Armenian identity, minor-modal in its special way. 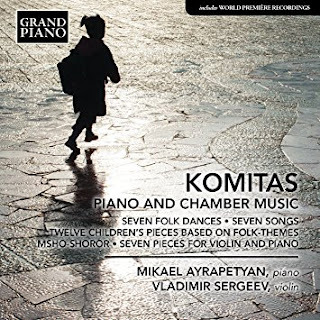 Mikael Ayrapetyan takes the piano chair and acquits himself well on the solo piano works, which consist of "Seven Folk Dances" (1916), "Twelve Children's Pieces Based On Folk-Themes" (1910), Misho-Shoror" (1906), and the World Premier recording of "Seven Songs for Piano" (1911). Vladimir Sergeev joins on violin for the World Premier of "Seven Pieces for Violin and Piano" (1906). Komitas had humble origins as the son of artisan parents in Turkey, He early on distinguished himself as a singer. In his subsequent tutelage as a seminary student he became familiar with ancient Armenian chant, hymns and folksong heritage. He was ordained as a monk and went on to compose the works that we remember him by. The Ottoman pogram against Armenians so unhinged him that he ended up in a psychiatric hospital where he resided until his death in 1935. Like Bartok and Khachaturian he envisioned the national folk legacy of his people as a vast repository of cultural value and sought to create pedagogical works for children as well as more complex art music works that deeply reflected on folk elements. The album at hand gives us a well chosen sample of both kinds of works, the "Twelve Children's Pieces" standing on one end of the spectrum, the "Seven Pieces for Violin and Piano" at the other. It is a program of great beauty, well played. Anyone who loves Armenian music (perhaps via the music of Hovhaness) will gladly appreciate this one, as well as anyone interested in folk inspired modern classical. It is a real treasure! Some solo piano works have been so ubiquitous, so often performed, that it takes a pianist with a different vision to shake you out of the near torpor you may experience. Of course there are often enough excellent reasons why a work is so widely played and heard. Still, it takes something special to wake you up. 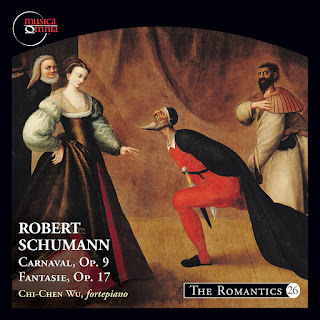 That is the case with pianist Chi-Chen Wu's recent recording of Robert Schumann's Carnaval, Op. 9 and Fantasie, Op. 17 (Musica Omnia 0705). We've encountered Ms. Wu before as the pianist on Schumann's Complete Sonatas for Violin and Piano (see review on these pages for March 1, 2016). She most impressively established her Schumann interpretive credentials on that disk. Tackling the "Carnaval" and "Fantasia" is something perhaps more of a challenge. So many notable and well-endowed pianists have gone there before. What can be left to say? They could be played still louder, still faster, or still slower, with still more rubato, all that I suppose. What would be the point? Chi-Chen Wu has all the technical endowment one would expect for a successful rendition of these repertoire staples. Yet the emphasis is not on dazzling the hearer with fireworks. Instead Ms. Wu gives us a very focused vision of Schumann by getting everything exactly right, and doing so in a most musical manner. There is a requisite passion, yes, but it is harnessed to the harmonic-melodic sequence with perhaps a slightly more Apollonian core than has been standard practice. Not that the renditions are cold, far from it. They are poised, balanced, emotive but precise. I would venture to say that this disk is an example of Schumann's Schumann. It very much zeroes in on the notes themselves, singingly and surgingly, but never as a kind of spectacle. It is an example of a more classicistic reading of Romantic piano, perhaps. For that is shows us Chi-Chen Wu the powerful yet centered pianist devoting great care to bringing alive the music. Less so the gesture of its realization. It brings us out of Van Cliburnian-Liberace-esque showmanship, brings us closer to the source. A new post takes us into the creative musical mind of living US-born composer Kevin Raftery. Chamber Music (Metier 28569) walks us through some meticulous and committed performances of four of his works, all highly advanced harmonically and expressive in a lineage that goes back to Alban Berg in its affective qualities yet manages to convey a very personal take on classic high modernism. Like Ives he composes and at the same time has had a foot in the commercial world, as a Project Manager. He nowadays sings in the new music oriented London Chamber Choir, plays bassoon professionally and is Music Director of the Richmond Concert Society. His opening "String Quartet No. 1" (2012) was written in memory of his friend Richard Oake, whose love of the string quartet was so pronounced that Raftery decided to plunge into a quartet of his own, even though he previous had avoided it because of those many masterpieces in the idiom and the idea to follow with another work seemed pretentious. Raftery holds his own however, with a highly developed presence, a kind of elegiac revery contrasting with a dramatic dynamic emotive stridency that is very nicely realized by the Heath Quartet. From there we go on to two works well played by members of the Berkeley Ensemble. "First Companion" (2012) calls for clarinet, bassoon, violin and cello; "Pleasantries" (2011) is for oboe/English horn, clarinet, bass clarinet and bassoon. Both combine seriousness of purpose with a kind of whimsicality, movingly so. The "'Friedhof ' Quintet" (2011) is perhaps the most stunning and introspective-expressive. For flute, harp, violin, viola and cello, it revels in the possibilities of the instrumentation to haunting results. The Animare Ensemble brings the music to life in glowing ways. The instrumentation and its handling lends itself to a sort of post-impressionist delicacy and fragility that stays in the mind and created a hushed mood of expectation that delivers its profound content with absolute candor. There is beauty and character to these works. 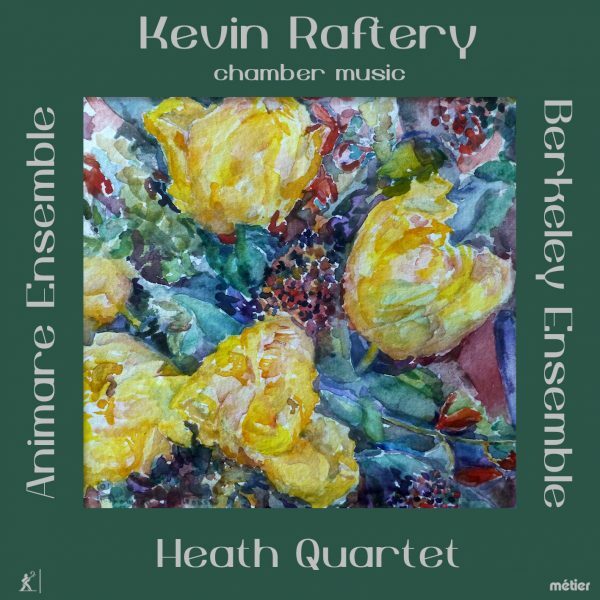 Raftery shows himself as a gifted exponent of high modernist chamber art. I come away from this program impressed and rewarded. Anyone with a liking for the intimacy of the chamber form and the sophistication of the classic modern expansiveness should readily take to this music as I have. Some music just lays right from the first hearing. Further listens fill in the details and yet the initial impression sticks with you. 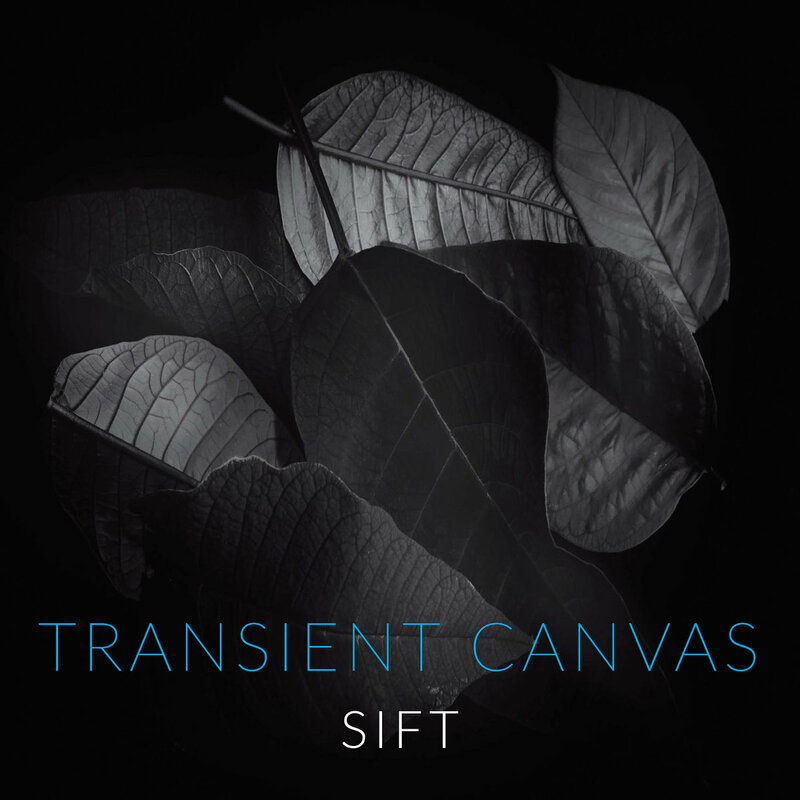 I feel this way about the duo Transient Canvas and their album Sift (New Focus FCR 190). It is a full length recital showcasing the bass clarinet work of Amy Advocat and the marimba of Matt Sharrock. The two instruments together make for a deep and rich sonance realized especially well by the fine artistry of the two. Five new music composers contribute one composition each. You may or may not know of these craftsperson-artists. It does not matter because each has something to say and brings out the color and dramatic potentialities of the instrumentation. Each work embodies a literal intent. The respective composer explains what that is in the liners. I paraphrase here. The title piece"Sift" (2014) by Daniel T. Lewis puts in musical terms what remains of a resolve when long subjected to struggle, and the exhaustion and collapse that can follow. Tina Tallon's "Dirty Water" (2014/16) is her tribute to Boston and an allusion to but not quotation from the Standells' old pop-rock hit. Chris Hughes and his "Vestibule III" (2013) comes to grips with an ever shifting transition between contrasting stylistic worlds, something all who follow new music modernism in its current incarnation can sense as part of where we are now. John Murphree's "Purge" (2013) creates in analogic musical terms a casting out of what once was or even still is important. The longest and perhaps most ambitious of the works concludes the program, namely Adam Roberts' "Nostalgic Variations" (2015). It contains within the main theme and its variants a middle path between "saccharine expression" and on the opposite pole "irony and rejection of emotion." The experience of the music itself understandably transcends or deepens the impact of any given composer's intent. This is contemporary music that neither rejects a modernist stance nor does it replace it with something wholly other. It is a series of cogent and fascinating vehicles that allow the duo and their very singular instrumentation to flourish and establish an immediate present-day identity. It is in the process a very absorbing and even exhilarating program all new music adepts will gravitate towards appreciatively, I would think. 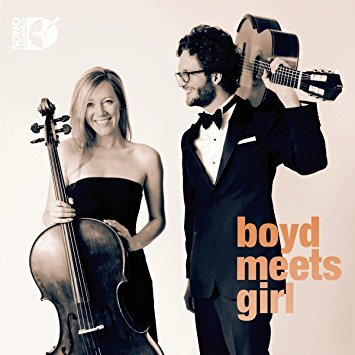 Two artists of stature, a mix of the contemporary modern and the classic, that is what goes into Boyd Meets Girl (Sono Luminus 92217). It is a sort of cute, flip title that presaged to me something light. However the music is delightfully presented, much more than a bonbon between meals. (Not that anyone I know eats bonbons.Yet get the point.) It is weighty without being insistently so. This way it can provide atmosphere or a good deal more if you listen seriously. The Boyd is classical guitarist Rupert Boyd. The "Girl" is cellist Laura Metcalf. Both have a beautiful sound and the technique to match. And the blend of the two makes for a special confluence. It is the brightly variegated repertoire that helps make the program especially pleasurable. We have more or less lesser-known contemporary works in Jaime Zenamon's "Reflexoes No. 6," Ross Edwards' "Arafura Arioso," Radames Gnattali's "Allegretto Comodo." Then there are the more familiar Astor Piazzolla "Cafe 1930: and Arvo Part's "Spiegel im Spiegel." And then for the more venerable classic side we have four of Bach's "Two-Part Inventions," Faure's "Pavanne, Op. 50," de Falla's "Siete Canciones Populares Espanolas." And to cap it all off there is an arrangement of Michael Jackson's song "Human Nature." It is the artistry of the two that ultimately makes this program stand out, that and the Boyd-Metcalfe arrangements for guitar and cello (as applicable) and the open-ended adventure of the program itself. If you have expectations about the wonderful sound of cello and classical guitar together, they are met with absolute style and grace in the twin sonarities of Boyd and Metcalfe. More than met, really. Boyd Meets Girl is one of those fortunate intersection where we hear bells as much as they do. A program that will appeal to a wide swath of listeners. It will do so with artistry at the highest levels. 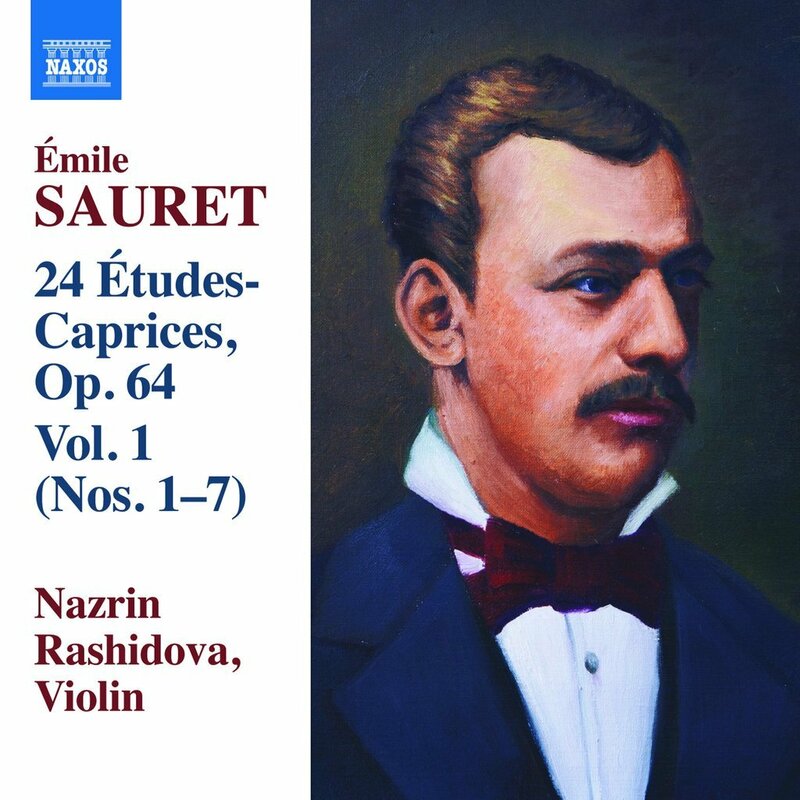 Of the sum of unaccompanied solo violin works, those of Emile Sauret (1854-1920) are among the lesser known to the layman appreciator. He was one of the greatest and most renowned violin virtuoso of his time. He left behind a Violin Concerto, some character pieces and some technical exercises, the most involved musically of which are the 24 Etudes-Caprices, Op. 64. Nazrin Rashidova apparently is in the process of recording them all. The first volume, covering Nos. 1-7, has recently appeared (Naxos 8.573704). These are alternately highly demanding, then highly lyrical rhapsodic works, owing as much or more to the tradition of a Paganini as to a Bach. They are in all 24 keys, Nazrin Rashidova tackles them with heroic passion and exactitude, with a beautiful tone and satisfying idiomatic flare. 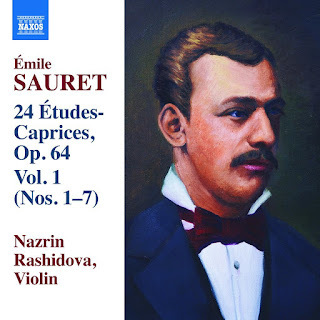 The Etudes-Caprices were published in 1902 They were dedicated to Sauret's violin student Marjorie Hayward, who had studied with him since she was 12 years old and was only 17 at the time of its publication. The pieces show no doubt his appreciation of her potential through the care that is put into each exercise. Needless to say these are much more than mere pedagogic vehicles. There is a complexity and expressive beauty to these Etudes that make them excellent listening some 115 years later. Ms. Rashidova brings us a ravishing interpretation for a most enjoyable program. Recommended. The world of electronic/electroacoustic music these days is open-ended and vast in possibilities. One of the most striking recent examples comes from US composer Doug Bielmeier. Betty and the Sensory World (Ravello 7972) is a set of seven interrelated movements that play upon the richly expressive sonic worlds of drone and harmonic overtone timbers that have an extraordinary beauty, a hugely ambient, ever shifting expressive, hypnotic quality. If my listening mind recalls the organic unity of some of Iannis Xenakis' electroacoustic environments of earlier days, perhaps it is no fluke. After all, Bielmeier studied composition with Robert Carl, himself a student of Xenakis. What may have been influential in Bielmeier's approach is so thoroughly internalized that what we appreciate in Betty feels wholly original. At times one hears affective harmonic melodic sequences that might have come from the mind of late Mahler, had he been alive today and a practitioner of the electronic arts. But at the same time and at all times there is such a rich unfolding of ambient sound panoramas, each cluster of timbres evolving and encompassing the listener with an orchestral depth and nearly unspeakable beauty. In that way we experience timbral development as much or more than melodic-harmonic development. A sensual attention to timbre as an unfolding, secret inner world Indian music masters have long practiced. . . sound as richly representative of deity. Bielmeier does that in his own way. It is a music that gets an initial impetus from sustained, altered resonances, an unparalleled sonic design that is then subjected to development and permutation. Each movement grows within itself so that the development is never into a completely "other" soundscape, is not variational in any post-Darmstadtian way, but rather hypnotically static yet ever moving within itself. There is no feeling of a minimalism per se so much as an organicity of internal presence that rivets the listener through a natural world kind of difference and sameness in dialectic balance. 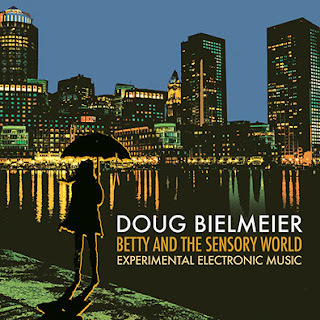 I come away from this CD knowing that Betty and the Sensory World is one of the more profound electroacoustic works I have heard in a long time. Anyone who reads this will I believe be very moved by an immersion in its enchanted world. If you can dream lovely dreams, you can enter this music in the same spirit. 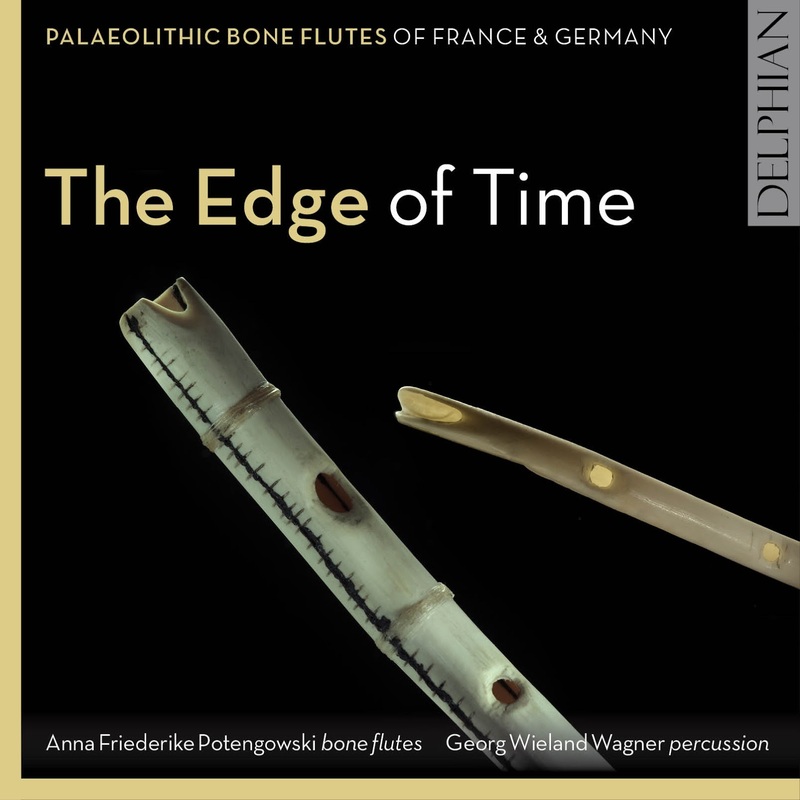 The idea of the archaic and new music rub shoulders on The Edge of Time, Paleolithic Bone Flutes of France & Germany (Delphian 34185). On it Anna Friederike Potengowski plays a number of reproductions of bird bone and ivory flutes discovered at sites in France and Germany. The original finds hail from the Paleolithic, some 40,000 years ago. They represent the earliest direct evidence of humanity as a music-making animal. What the music sounded like we cannot know, of course. Flautist Anna Friederike Potengowski has learned to play four reconstructions of the flutes, working intuitively with the instruments to develop a well-conceived playing technique. She is joined by percussionist George Wieland Wagner for a number of compositions the two have assembled around the flute and percussion possibilities, plus an improvisation or two and a composition by John Cage and one by Rupert Till. The resultant music, by imagining a distant dawn of music, is a mysterious meld of sophisticated primitivism as new music. That John Cage's "Ryoanji" does not sound out of place among these works tells us much, that a primality clears us from the residue of 1000 years of classical tradition and jettisons us forward into a kind of rediscovery of our putative roots. The flute work by Potengowski involves a technical triumph, plays upon the complex sonic possibilities inherent in the deceptively simple constructions of wood and bone. And who is to say she is wrong to put so much artistry into the playing? We cannot know how good any given Paleolithic flautist might have been. And in the end it does not matter. What does matter of course is the music as it speaks to us. It is a creative winner on all counts, varied and haunting. There is nothing quite like it. You with a sense of adventure would do well to hear this one. It is simultaneously a meditation on our origins and a music very much of today. Bravo! Any confirmed classical music listener will have at least some works she or he has heard over time often and in more than one performance (in the recorded medium), and perhaps in concert as well. When faced with a new version, the older ones one has heard inevitably stand in comparison to the one you are hearing. 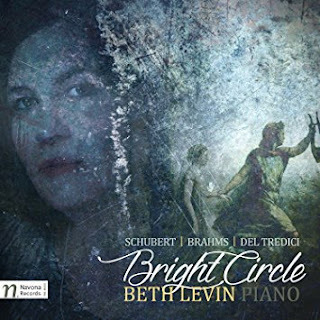 That is true for me of two of the three works contained in pianist Beth Levin's Bright Circle (Navona 6074). Johannes Brahms' "Variations and Fugue on a Theme By Handel, Op. 24" is one of the monumental theme and variation sets of its time, a wealth of contrasting treatments of Handel's theme that challenges the pianist to coopt the technical demands in the service of the extraordinary variational eloquence. Beth Levin once again finds a way to underscore the musical drama of each movement with interpretive clarity and passion, while in this case expressing fully the majestic wholeness of the music. The final performance centers around David Del Tredici and his"Ode to Music," which is based on Del Tredeci's original arrangement of Schubert's An die Musik for wind quintet. This is its ultimate re-expression for solo piano. The piece as thought through by Levin serves as a fitting close for this program. In the end we have some very personal and ultra-musical pianistic poeticism from Beth Levin. She neither seeks to steal the show with eccentric visions of these wonderful pieces, nor does she disappear in the telling of the musical narrative. The interpretations do not wear the emotions on the sleeve as much as channel content and affect for the sensibilities of our present-day selves. That is a tightrope walk that not everyone can pull off and still be themselves. Ms. Levin triumphs in doing just that. The spectrum of styles to be had in the hands of talented present-day composers is pretty vast. Anthony Paul de Ritis exemplifies a modern tonal postmodernism, inventive well orchestrated music we can hear productively in his recent release Pop Concerto (BMOP Sound 1051). 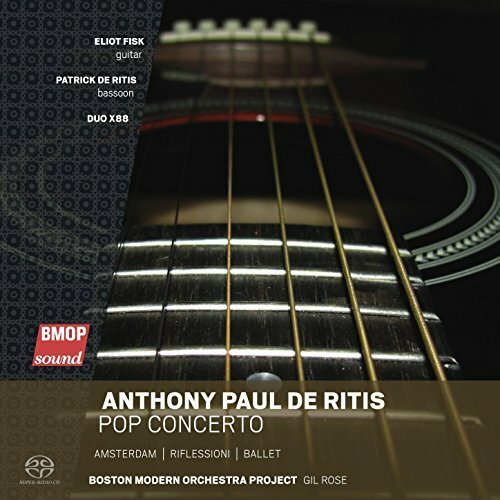 It consists of his "Pop Concerto for Guitar and Orchestra" (2014) plus three additional works, as played with relish and verve by the Boston Modern Orchestra Project under Gil Rose. This is music minus the usual repetition of minimalism, yet there still is a working through of motives and a sort of variational lucidity that moves away from rapid looping and regains horizontal developmental trajectories in keeping with modern tonal stances. There is ever a rhythmic vitality to this music, a factor that gives it all a very contemporary edge and alludes in part to rock-pop forms. That is most pronounced, understandably, in the title work "Pop Concerto for Guitar and Orchestra" featuring Eliot Fisk on acoustic guitar. The music in each of the four movements is based foundationally around a rock-pop song of note. Namely "Bring it On" by Seal, Alanis Morissette's "You Oughta Know," "Beautiful Day" by U2, and "The Way You Make Me Feel" by Michael Jackson. The key to the success aesthetically of this concerto is the reworking of the song material and the inventive quality of the solo guitar part. The final results are far more than a simple arranging of song material to fit an orchestral-guitar solo idiom. There is on display a thorough conceptual rigor and flow that brings it above an arrangement and into new compositional territory. The bonus works extended our appreciation of the composer's originality. "Amsterdam" (2004) is a tour de force showpiece for orchestra that reminds of Michael Torke's orchestral work, gives us a kind of modern-day equivalent and springboarding off of Aaron Copland, yet makes strides in an original direction. "Riflessioni" (2014) enters more complex labyrinthian depths of orchestral complexity with mysterioso darkness and heightened expressionist syntax for both solo bassoon (Patrick de Ritis) and full ensemble. It is the more modernist of the works to be heard in the program, and perhaps a bit more esoteric-serious-moody than the others. Finally there is "Ballet" (1997/2013) featuring the two piano Duo X88 (Vicky Chow and Saskia Lankhoorn), a substantial 20-minute work. It is slightly more "radically tonal" perhaps than the others, with a forward momentum like "Amsterdam" yet also a sort of quasi-pentatonic-modal cascading flow running parallel inside of the rhythm..
de Ritis leaves me with a firm conviction that he has managed to come up with a new synthesis that is original and definable in personal terms. It is well healed, sonically mapped music with much to recommend it. I strongly favor this one.